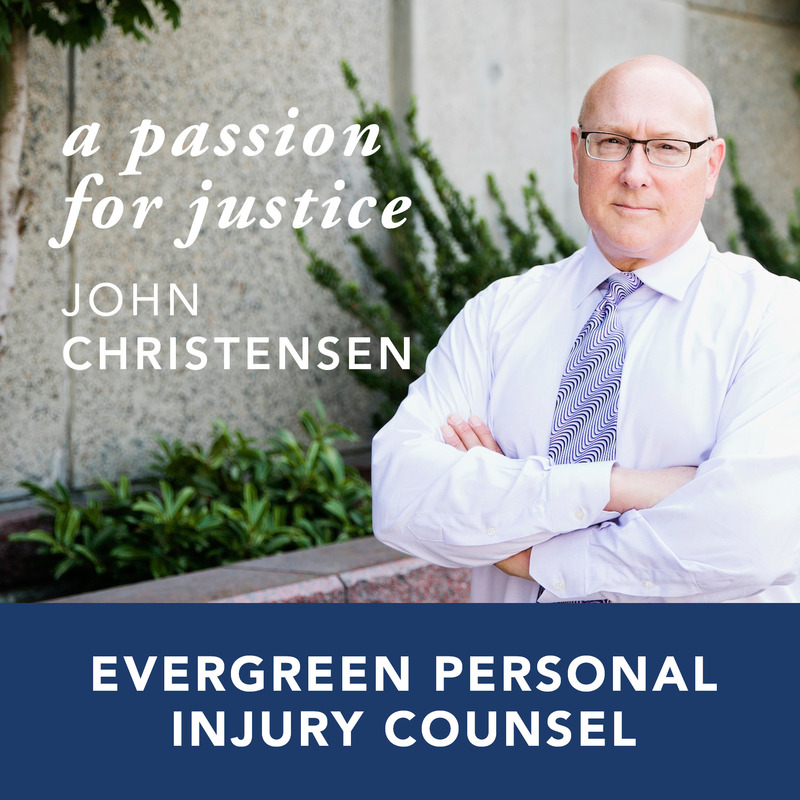 Evergreen Personal Injury Counsel attorney John Christensen has spent his career helping people seek justice for more than three decades. From medical negligence to government supervision, highway design, severe motor vehicle collisions, and dram shop liability — John has devoted himself to helping others who have been injured and are undergoing difficult times. He values the trust relationships he builds with clients from the time he first meets them to the ultimate resolution of their case. “Helping people get back to where they were before tragedy struck never gets old and is always rewarding,” John says. John has always taken a keen interest in science, medicine, and law. He found personal injury law to be a natural fit of all three. He tries to empathize and understand what his clients are going through, how it’s affected their lives, and how he can help them achieve lasting security when their case is resolved. John’s passion for justice and law comes from looking in from the outside and seeing how big insurance companies and corporations unfairly treat people with less privilege. John found his home at Evergreen Personal Injury Counsel amongst the other compassionate attorneys who share his drive for helping those in life who are less fortunate. Many current and former clients have remarked how the attorneys at EPIC have taken the time to get to know their story and empathize with what they are going through. Throughout his legal career, John has been the recipient of many awards that recognize his achievements and contributions in the legal community. He was elected President of the Tacoma-Pierce County Bar Association in 2015 and received the “Outstanding Service Award” in 2012 and 2017. John has won many significant legal cases including a recent $13 million probation supervision wrongful death case, a $4.2 million bicycle crash case, a $2.8 million swimming pool near-drowning case, and a $3.5 million construction site case. In his spare time, John enjoys playing classic blues music and collecting vintage guitars. He got his musical chops at an early age by playing orchestra and jazz music on the trumpet while in middle and high school. He’s also a black belt in Taekwondo and competes in full contact Olympic sparring on both State and National Levels. He’s won several National and State titles in sparring and forms in 2012 and 2013. John also tries to give back to the community in the form of charitable work. He’s a volunteer martial arts instructor at the local YMCA. Through the “Y” and the local bar association, he tries to keep busy volunteering to help make the community a better place for all.